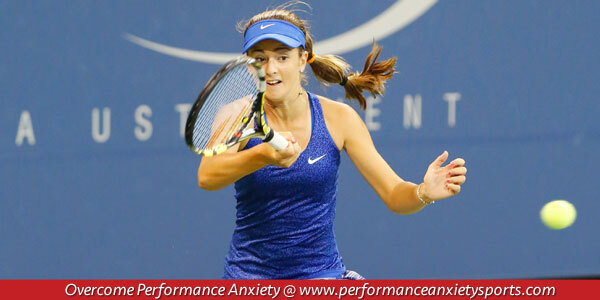 You are here: Home / About Sports Performance Anxiety / What is Performance Anxiety in Sports? Many athletes under perform in competition compared to the ability the show in practice. In my work as a mental game expert, this is a common problem for athletes. If performance anxiety is affecting your sports performance, it’s a mental game issue. If you can perform well in practice, but can’t take it to the field, course, or court, it is most likely that anxiety, tension, or fear is getting in the way. The ability to take your “practice game” to the playing field is critical to your success sport. The signs of performance anxiety in sports are when you are anxious, nervous, forgetful, or too tight to perform freely in competition. Your fear of embarrassment of worry about losing causes the tension. My view is that performance anxiety for athletes comes from an underlying fear of failure. Fear of failure is one of the major barriers to success for athletes. The concept of fear of failure is tied closely to fear of rejection and social approval. Fear of failure is also prevalent with athletes who are perfectionists and over motivated. If you have a need to succeed badly, you are likely to fear failing. Several associated issues come with fear of failure, such as low self-confidence, anxiety, tension, worry about making mistakes, and so on. Some athletes will tell you that fear of failure is what motivates them to practice and work hard. Fear of failure may be a motivator to work hard, but it’s not a good motivator or mindset for competition. Some sports psychology experts view choking as a response to performance anxiety. And I do think performance anxiety can lead to choking for athletes. Choking comes from the notion that when athletes are anxious they feel out of breath as if someone is choking them. But that’s just one symptom of performance anxiety in sports. Some athletes who choke begin to expect they will “choke” in competition. If you have performance anxiety in sports, you are not alone. It’s a common challenge in athletes who are compelled to perform at a high level. The irony is that the more you want to win or be successful in sports, the greater the chance that fear of failure will hold you back.